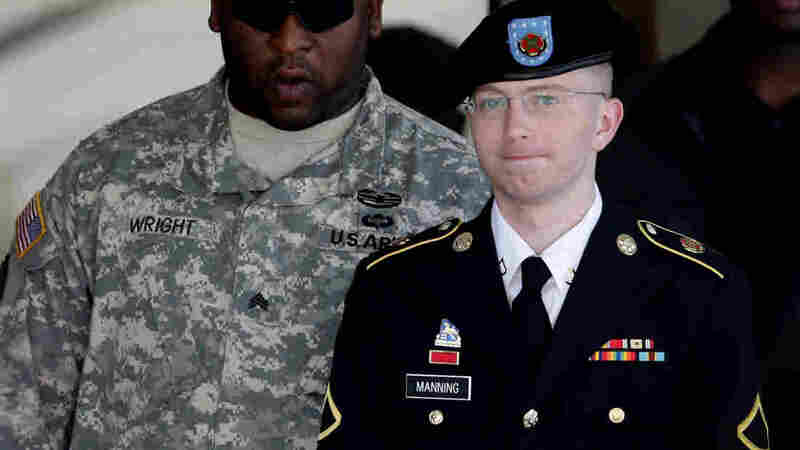 Updated: Military Judge Accepts Bradley Manning Guilty Plea : The Two-Way Manning pleaded guilty to 10 smaller charges. He is still expected to be tried for the charge of aiding the enemy. During the hearing, the Army private also provided the first detailed explanation of why he perpetrated the biggest leak of classified information in U.S. history. Army Pfc. Bradley Manning (right) is escorted out of a courthouse in Fort Meade, Md., on June 25, 2012. His lawyer announced that Manning, who is accused of leaking classified information to WikiLeaks, had agreed to plead guilty to lesser charges. A military judge in Fort Meade, Md. accepted 10 guilty pleas from Army Pfc. Bradley Manning on Thursday. Manning pleaded guilty to lesser charges, but he is still facing a court martial over the charge of aiding the enemy. "Manning says he misused classified information when he leaked thousands of war reports and diplomatic cables to the web site Wikileaks. "He also acknowledges breaking the law but he's fighting the most serious charge against him — that he aided al-Qaida with the biggest leak in U.S. history. "Military prosecutors say they will move ahead with that criminal count, which carries a maximum term of life in prison." During a pretrial hearing in Fort Meade, Md., today, Army Pfc. Bradley Manning gave his first, lengthy explanation for perpetrating the biggest leak of classified information in United States history. "The slight, bespectacled soldier read from a 35-page statement for more than an hour, speaking quickly and evenly, with little emotion, even as he described how troubled he was by the material he leaked. "The battlefield reports were the first documents that Manning decided to leak. He said he opted to send them to the anti-secrecy website WikiLeaks after his efforts to give them to The Washington Post and The New York Times were rebuffed. "Manning said that, in his experiences, the battlefield reports were not treated as especially sensitive, particularly after the events they documented faded into the past. "He said he was concerned about leaking hundreds of thousands of sensitive State Department cables but that he ultimately decided they would not be harmful since they were so widely distributed within the military. "'I thought these cables were a prime example of the need for a more open diplomacy,' Manning said. 'I believed that these cables would not damage the United States. However, I believed these cables would be embarrassing.'" Kevin Gosztola was tweeting from inside the military court room. He reports Manning said the "bloodlust" seen in the "collateral murder" was alarming. "They dehumanized individuals they were engaging," Manning said, according to Gosztola. According to the AP, Manning compared the actions of the soldiers on the helicopter to those of a child "torturing ants with a magnifying glass." The New York Times' Charlie Savage was also tweeting from the court room. He tweets that ultimately Manning said he decided the "world would be a better place," if it saw the sensitive State Department cables. "I believed that if the general public, especially the American public, had access to the information ... this could spark a domestic debate on the role of the military and our foreign policy in general," Manning said according to the AP. As we told you, yesterday,Manning also pleaded guilty to lesser charges, which prosecutors were not pursuing.